Please call owner Ron at 416-894-4238 or 416-894-8900. Boat Location: Toronto, Ontario, Canada. 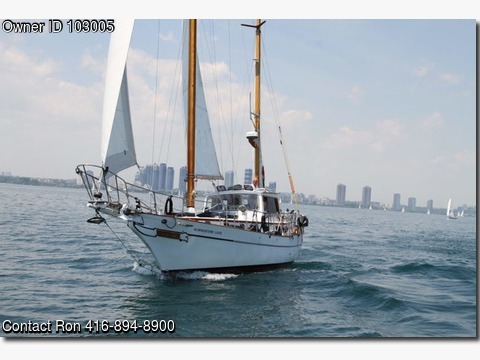 SEE: www.summertimelove.ca 41' Yankee Clipper Ketch Full Keel Available at the beautiful Mimico Cruising Club as a Liveaboard. This beautifully maintained sailboat offers, a powerful totally rebuilt 4-108 diesel engine which provides plenty of power to supplement the wind when necessary. The pilot house offers protected steering when in poor weather conditions. Many Additions have been added to the original boat 4.5 Entec Generator 2500 Charger Inverter Force 10 stove and oven 3 burner Heavy duty Davits New Garmin redar 18" New Garmin GPS Hydraulic steering Depth, speed and wind instruments Icom sat radio VHF radio's in main cabin as well as in pilot house 800 AMP battery pack as well as seperate engine battery. New Nova Cool fridge and freezer Espar forced air and heating 2 heads forward 35 gal holding tank and aft cabins 45 gal stainless tank Anchor 75lb stainless plough and 35lb plough 160 gal water in 2 80 gal stainless tanks 2 bilge pumps 1 deck wash pump 1 washer/dryer 1 80 gal pure water maker.